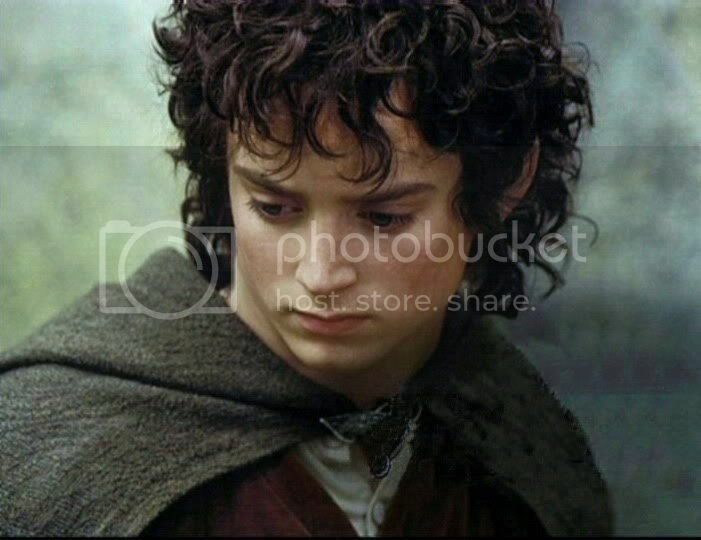 Do any of you know where the shot of Frodo posted below comes from? In all my capping and poring over galleries, I had never seen this image until Ariel posted it in a thread recently, in the form of a wallpaper with lyrics from "Into the West" superimposed over it. To restore it to what might have been it's original appearance, I have clone-brushed the text out of the frame. Where does this come from? Is it in the final films at all? From never-used footage? A publicity still? This portrait is my new all-time favourite. It's fabulously painterly, a beautiful picture no matter whom it depicted. But, as it is, it's a superb Frodo portrait, capturing all of his beauty, but so much more. The pose, the expression, the lighting awork together to convey a mix of moods so subtle, I haven't yet decided what inner thoughts and feelings his face best portrays. Maybe that's one of the reasons I like it so much ... it is left up to each viewer to sense what might be going on inside Frodo, and the viewer's own mood each time she looks at it. 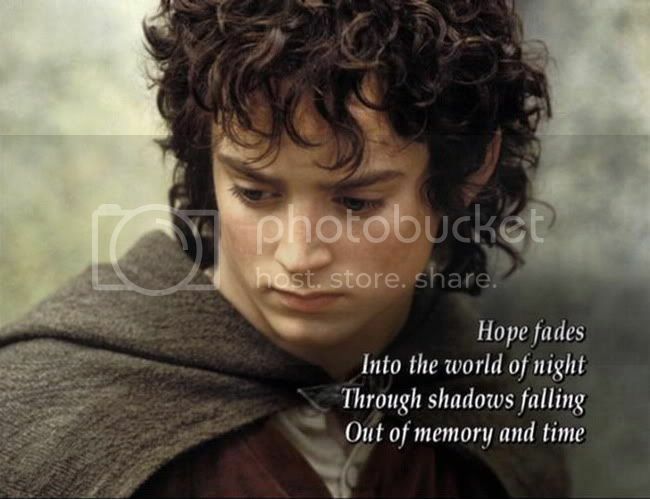 When I first saw it posted, I was sure it was the source for a very popular image of Frodo, one I secretly call, "Dark Beauty Frodo." 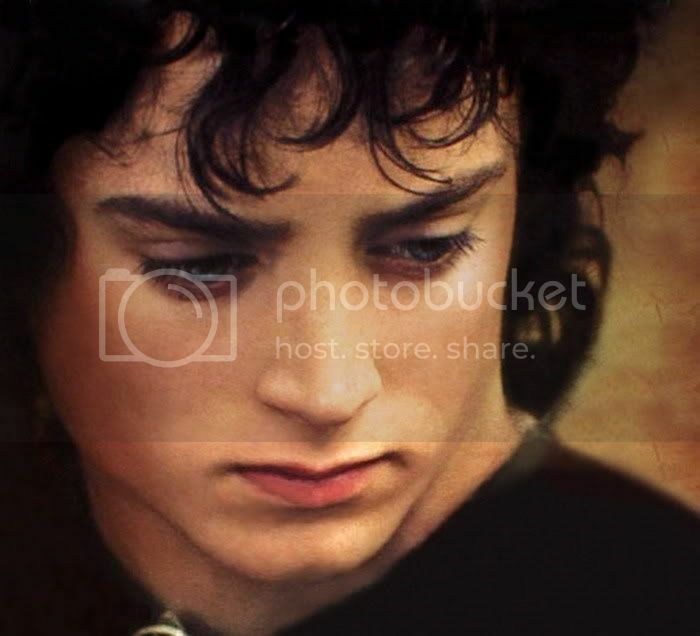 I used it for the face in my Frodo Art Travesty manip, After the Bath: Frodo Before the Fire. To me, it looks like it came from the same image, but reversed, then photo-shopped. Edited to add: Wendy, below, said it came from the extra DVD that came with the Special Edition version of the RotK soundtrack CD. She was right. I made a cap from my copy, posted below. I might be wrong (since I haven't seen the film in awhile), but it looks something like a shot from FOTR, as the Fellowship is on the River, approaching the Argonath. Well, dang! I'll have to pop in my DVD and take a look! Thanks, Shirebound! Nope, just looked. It's not there. Boo hoo. You have to have the special edition soundtrack from "Return of the King", with the dark green leather case, which had included within, a DVD featuring interviews with Howard Shore, Annie Lennox and a few other key people . Yes, I do own that. In fact, it's what I had Howard Shore sign at the LotR symphony. Wouldn't you know it? It must be in the car and it's out. Do you mean it's on one of that second interview ALL THE TIME???? I only watched that disc once. I'll have to cap the thing! I watched that sequence, too, Mews, thinking it likely, and all of Amon Hen, but the shot wasn't in there. Maybe it's in the EE? I have been mostly been screencapping from the theatrical edition. It occurs to me, Mews, that perhaps you read and answer your LJ notices directly from email. If so, you won't have seen Wendy's comment (up there above the picture with the text on it). I am betting she has got the answer right. When I find my CD, I am going to pop in that DVD that came with it and see. P.S. I meant to say on your LJ how much I love how you made that wallpaper of the "Frodo by firelight" shot, going along the right side of your entry. In "The Harem" thread at K-D, posters there who went back farther than I, from before release of FotR, said they were all so beside themselves over that picture when it first came out, they called it, "the Frenzy." Well, I have gobs more film to pore over in the months ahead and I do bits of screencapping. You KNOW I will be looking for it. The background automatically X's out a lot of scenes, in which the immediate background is quite different, even though the look is similar. The only thing certain is that it's from a scene AFTER Lothlorien, since he's wearing the mallorn brooch. Perhaps the EE scene at the crossroads, since Frodo is looking back and down? Perhaps I'll have to check that later. Yes, definitely after Lothlorien. I have been wondering - maybe you should fiddle a bit with the lightness and colours of the pic? I have the feeling that they are not how they were in the original. I made a few icons recently where I was surprise by how different a pic looked when I only increased or decreased the lightness.